Walter Overla is one step closer to the ABA National Championship with a first place win in an American Fishing Tour bass tournament held on Dewart Lake, Indiana this past weekend. Overla brought in a possible lake record with five fish that weighed an amazing 19.49 pounds. 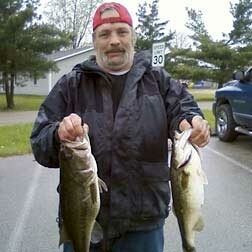 He also caught the Big Bass of the tournament with a 6.12-pound largemouth. B.J. Edwards took second place with 14.25 pounds, while Dirk Hayward finished third with 12.2 pounds. Big bass was awarded was to Walter Overla for catching a 6.12 pound large mouth. This division's next tournament will be May 5th on Crooked Lake in Steuben County at the DNR ramp.